Joey Barton is out to clinch the Championship title on Saturday – and then sort out his Turf Moor future. 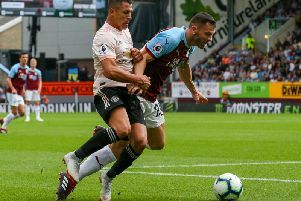 The 33-year-old midfielder has been a major catalyst in Burnley’s promotion campaign, having signed a one-year deal back in August. The club have been in negotiations with the former Manchester City man, who is looking for a longer-term deal as the Clarets prepare for life back in the Premier League. Barton – who has bounced back from relegation from the Premier League at the first attempt with both Newcastle and QPR – said: “The club made me an offer about six weeks ago and I said ‘look, it’s far too late in the season, my mind is winning on the Championship, let’s get over the line, pat ourselves on the back and then sit down’. “There’s a desire for me to be here, that hasn’t changed, but at 33, stroke 34, I don’t know whether I want to stay for a year, that’s the reality of it. “We’ll sit down and negotiate, I’d like to stay here longer. “At this stage of my career it’s not financial, there’s no financial angle for me, I just want a bit of stability. “My eldest child is about to start school so I want to put some roots down somewhere. “If Burnley want me here great, if not then I’m summising that there’ll be one or two options. And he hopes to be as good as his word at Charlton. After being unveiled at Gawthorpe, he was in typically defiant mood, and – one win from sealing the Championship title – Barton isn't settling just for promotion back to the Premier League. He said: “The goal for us is to win the league, and we’ve not done that yet. “We look forward to going to Charlton with the pressure off, but we’ve got to win and go and cement it. “There’s no better way to go into the summer than being 23 games unbeaten, the Championship trophy – you go down in history, there’s some illustrious names in football clubs and players who have held that aloft. The trophy was handed to the champions of England before the advent of the Premier League, but Barton got his hands with it with Newcastle, and added: “I was fortunate enough to be part of a squad that won it at Newcastle, and while I got promotion at QPR, you go via the play-offs and it’s a fantastic way to go up – it’s not being champions, it’s not being the best team in the league. “I think since the defeat at Hull we’ve been that, we’ve been resolute, disciplined, it’s a real collective effort. “There’s been individuals when Vokesy has won the game on Monday, and others when Andre has done it or Boydy or Scotty, it’s an absolute team effort. Barton has bought into Sean Dyche’s culture and environment, and he has been impressed by what he has seen: “That’s what we’ve got. This football club gets many things labelled at it, but there’s no tighter knit group of lads. “For everything we lack in other departments, we make up for in ******* really. We’ve got the biggest ******** in the league and that’s shown on many occasions. “Look at the Brighton game, we could have had disappointments with the goal disallowed, but we just come again and score. “Nobody gets disappointed here, we just keep coming and coming and coming. “There’s that relentless about us. “In the early part of the season we saw teams that offer this or that, but I wouldn’t have swapped us at any stage.